Gerald (Gerry) McDonald passed away peacefully on March 9th 2016 in the Hamlets at Westsyde Kamloops BC. He was 91 years old. Gerry was born April 25 1924 in Saskatoon Saskatchewan. The son of Angus Rory McDonald and Leonie Marguerite (Margaret “Peggy” Garner) they lived on Grandfather, Archie McDonalds Ranch overlooking Lac Des Roche near Bridge Lake B.C. for a few years. While growing up in the Caribou and North Thompson Gerry learned about farm life and wildlife, he loved being outdoors, grew fond of horses and learned to ride, hunt and fish. Gerry went to school in Blackpool for a few years and moved around the province with his parents as his dad worked in mining, ranching and construction. Eventually the family settled on a small farm in Little Fort. Gerry enlisted in Canadian Forces 1943 at 19 years of age. He was a motorcycle dispatch rider in England and was at the D Day landing as part of the Tank Corp. While in England after the war he married Joyce Adelride of Surrey England, Daughter Frances Muriel was born in Kamloops BC in 1946. They settled in Blackpool BC, however, the remoteness of the settlement and cabin life did not agree with Joyce so she and toddler Frances returned to her family in England. Gerry worked at several jobs after the war including at Newberry’s sawmill, truck driving and firefighting. In 1950 Gerald met Rosemarie Rainer at a pie social in Darfield. They were married in 1952. He and Rosemarie moved to Castlegar where Gerry worked at the bus cooperative. First son, Ray was born in Nelson BC in 1954 before the family returned to Barriere. Gerry drove truck for Alfie Morton and for the Department of Highways he also worked as Millwright at Fadear Creek Mill for a time. In 1955 Gerald and Rose bought property on the Dixon Creek road and built the family home. Son Christopher arrived soon after in 1956, Daughter Jeanette completed the McDonald Family in 1958. Gerry worked out of town at the Clearwater Forest Camp and the Rayleigh Camp as Correctional officer for several years before he bought his own logging truck a “Mac” that he was very proud of and drove for many years hauling logs to the valley sawmills before he retired in 1989. Gerry loved to go camping, fishing, hunting and enjoyed watching hockey with his family his hobby was to tinker in his wood work shop and making wood gifts and doing projects around the family home. 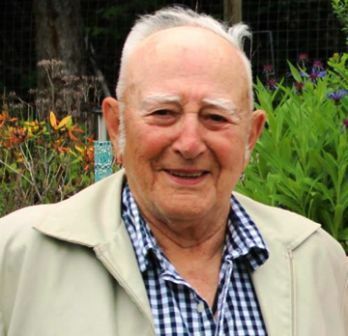 Over the years Gerry was one of the founding members and active in many organizations including Barriere Water Board, Ambulance Society, Lions Club and the Barriere and District Seniors Society. He helped to build the seniors centre. While retired Gerry and Rosemarie spent many hours at meetings, cooking pancake breakfast, carpet bowling, playing cards with friends at the seniors hall. Gerry also enjoyed playing pool with friends. Rosemary and Gerry were married for 52 years and took great pride in their garden, fruit trees and yard before her passing in 2004. Gerry loved bird watching and could whistle and bird call like many of the species that visited their feeder and bird bath. Eventually he sold the family home and moved to the Yellowhead Pioneer Residence enjoying the company and cooking by the staff. Later he moved to the Hamlets in Westsyde where his daily care needs could be better met by the compassionate crew of Care Aides, Nurses and Staff. While at the Hamlets Gerry met companion Cornelia (Corrie) Mainland and spent his last years in her loving company. Together they played cards and crib, enjoyed participating in activities and going to pub night dancing. Gerry’s quick wit, broad smile will be sadly missed by family, friends and care staff. Gerald was predeceased by parents Angus and Peggy, brother Leon, sister Margarite Proctor, wife Rosemarie and daughter Frances. He is survived by children Ray (Teresa) McDonald, Christopher(Tammy) McDonald all of Barriere BC, Jeanette(Ed)Noble of Clearwater BC, son in law Michael Smith and Grandson Jason Smith(Davina) Queensland Australia, Grandchildren; Mike McDonald(Teresa) Victoria BC, Suzanne Talkington(Taylor) Georgia, USA, Dustin Noble(Cindy) Airdrie Alberta, Monty Noble and Dani Noble (Tyler) Clearwater BC, Alex McDonald, Whistler BC. Great Grandchildren; Kaeli, London, Adisin Tori, Ebony, Lochlan, Lily, as well caring companion Corrie Mainland and long time friend and neighbour Mike Wurtz. The Family would like to acknowledge the kindness and care given to Gerry by Dr Terry Clare, Dr. Andrew Wynn, the nurses, care aides and staff at the Yellowhead Pioneer Residence, The Hamlets at Westsyde and Royal Inland Hospital. We truly appreciate the care and attention you gave to Dad over the years. In lieu of flowers please make a donation to a charity for Veterans or Seniors of your choice. A Memorial Service will be held at Barriere and District Seniors Society, 4433 Barriere Town Road, March 28th at 11:00 a.m.